The Social Security Administration reports that when you retire you will be able to get by on 60 to 70 percent of your present income. We completely disagree. http://lovelygoldthings.com/wp-json/oembed/1.0/embed?url=http://lovelygoldthings.com/2017/06/jean-skirt-trend/ http://himikosadiki.com/lines2-2/ We believe there are few people who will be able to retire on 2/3 of what they have a hard time living on while they are working. One major problem with the idea that you will need less income in retirement is the fact that many things will cost more in the future due to inflation. 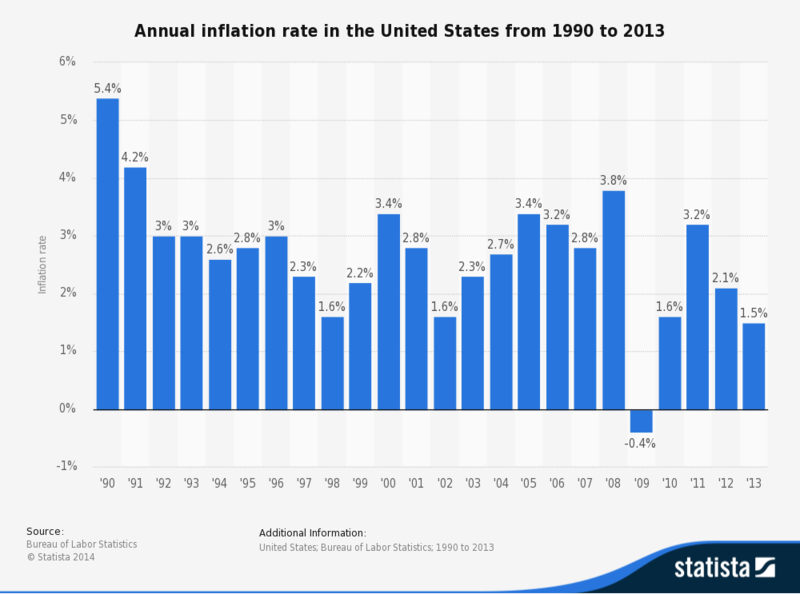 The Federal Reserve says that the average annual rate of inflation over the last 30+ years is about 3.0%. 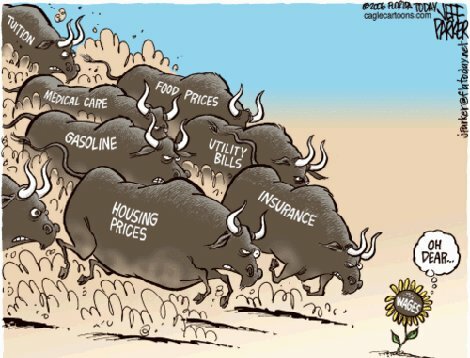 Over time, the purchasing power of your money is eroded by inflation. An inflation rate of just 3 percent means that what costs $10,000 today will cost $10,300 next year. In other words, your $10,000 today will only be worth $9,700 next year. In thirty years the same $10,000 would be worth only $4,120, a decline of 59 percent in purchasing power. If I put $10,000 in a can and bury that can in my back yard and I dig it up 30 years later, it would still be $10,000. However, it would be able to purchase $4,120 worth of goods and services. Will your property taxes be less during retirement? How about the maintenance costs of an aging home? How much will gas cost per gallon? How much will food cost? How much will your electric bill cost? Many believe inflation will not be that large of a burden because they plan to have their home paid off by the time they retire. An April 2013 survey conducted by Securian Financial Group found that 59% of retirees carry mortgage debt during retirement. However, let’s assume your home is paid off by the time you retire. 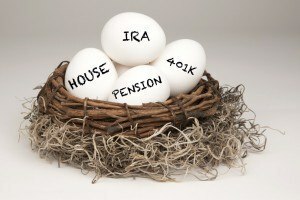 Will it be a problem during your retirement if your monthly medical costs are more than your current mortgage payment? These are things that few people take into consideration in planning for their future, but may have an impact on their lifestyle during your retirement. Most retirees have the majority of their assets in their home equity and IRAs/401(k)s. As they start withdrawing funds from their IRAs/401(k)s they are hit with a significant annual tax bill. When they could use the mortgage interest deduction the most they no longer have it. The kids have moved out and deductible contributions to their IRAs/401(k)s have stopped. They’ll likely have only their personal exemptions and the standard deduction as write-offs on their taxes. They’ll have to take significantly larger withdrawals from their IRAs/401(k)s than they otherwise would just to pay the income taxes. The way to win with an IRA/401(k) is by withdrawing the money when you’re in a lower tax bracket than you were in when you deferred paying the tax, and those who participate in these plans do so because they were told they will be in a lower tax bracket when they retire. But, what does it typically mean to be in a lower tax bracket? It means that you have less income to live on and if you have less income to live on it means your lifestyle will necessarily decrease. Are you going to work your entire career to get to a place where you can enjoy a standard of living that requires a certain amount of income just so you can retire and have less income and less lifestyle? Is that what you really want? It has become more important than ever for Americans to save for their own retirement beyond Social Security so it can, in fact, be a supplemental retirement income. If you would like to discover which savings strategies may provide the greatest opportunities for you call us to schedule a time to discuss your specific circumstances.